It's important that the iPod touch be 2nd generation because the 1st generation doesn't support microphone input which we'll need to make phone calls. The iPod touch comes with headphones that don't contain a microphone, and the device doesn't have a built in microphone. To overcome this limitation, we'll need to buy a new set of headphones that include a microphone. If you want to do this for testing purposes, I'd recommend trying one of the SIP providers because they give you a few credits for free and it's pretty neat to hear your home or cell phone ring when you dial it. If you're looking to really use this longer term I'd sign up for Skype. In order to test Skype, you'll need to buy a $10 credit (which would last you a long long time if you actually used it) but for testing purposes it seemed like overkill. 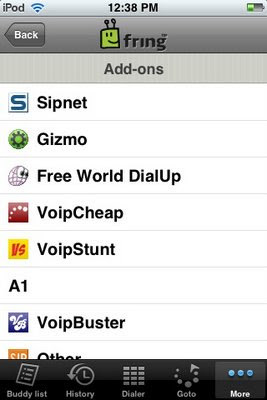 Regardless of the provider you choose to try, you'll eventually associate your Fring account with your SIP provider or Skype by going to Fring->More->Add-ons and then select Skype or SIP (and then your SIP provider) and then entering the User ID and Password associated with that 3rd party provider. Once you've successfully configured your SIP provider or Skype, you should be ready to try a test call. Make sure you have a WiFi connection, connect your headset and then go to the Fring dialer. 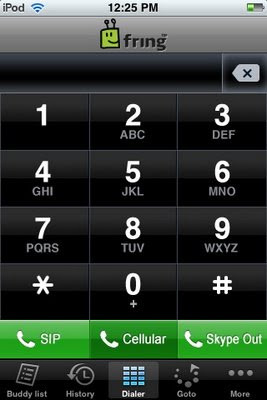 You'll know the SIP provider or Skype has been successfully configured when you see the green SIP or Skype Out buttons on the Dialer enabled (ie, they'll be green instead of black). Dial up the number you want to reach and press the SIP button when done. If you're successful you should hear a ring! It's worth mentioning that if you just wanted to test this out you wouldn't even need a headset/microphone- you should be able to make the phone ring without the microphone and even hear your voice on the landline or cell phone (the other end just won't be able to hear you since the iPod touch does not have a microphone built in). While this may seem silly it may be useful to see if you can successfully dial the numbers you want to dial and assess the voice quality/latency associated with this approach before buying the microphone containing headset. Although this technique is interesting, I hardly consider it practical. These days, domestic calls are virtually free anyway and cell phone minutes aren't even that expensive. The big problem as I see it is that if someone wants to call you, they first have to make sure you're up and running Fring before calling you (iPhone Apps aren't allowed to run in the background, and I rarely have my iPod touch "on"). And if someone was calling you from a landline they wouldn't have a persistent number to dial unless you signed up for Skype In which isn't free and kind of defeats the purpose of this exercise. The voice quality when I dialed our home phone from my iPod touch through Gizmo was unacceptably poor. When I tried calling a Skype user on a PC, it was noticably better. Fring to Fring calls iPod touch to iPod touch were "OK" but it was hard to tell given that the other user I tested with didn't have a microphone. I can only see this set up worth pursuing in two scenarios: (1) Internationally, where it's really expensive per minute to dial from a cell phone or landline -and- WiFi is available and affordable. (2) Where you have a cell phone that's lost service because you're inside a building and you really need to make a phone call. Note that these techniques would work equally well on an iPhone as on the iPod touch- the advantage there being that you wouldn't use minutes -and- you can call over WiFi. The thing I'd really like to see here is that the iPhone would seamlessly transition to making/receiving calls over WiFi when cell coverage is unavailable. I'm hesitant to switch to an iPhone because AT&T service isn't very good at our house and I'd hate to have to constantly tell callers "could you try me on my landline"? I'm not sure whether it is technically possible for Apple to pull this feat off, but I think it could be a selling point for the iPhone if they were somehow able to. Like I said, I hardly consider this approach practical. In my tests, the voice quality just wasn't good enough and the hassle associated with this just isn't worth it for me. The only time I could see this being worth considering is if I had a trip overseas and wanted to call home and talk for an extended period. However, if the voice quality internationally were as poor as what I've experienced calling our home line from my iPod touch, I don't think the conversation would be enjoyable (hence, what's the point?). That said, I do see this capability as being another example of the power of the App Store model that Apple has put forward, and an instance where the iPhone/iPod touch is more of a mobile computing device than a simple mp3 player. Question of the Day: What do you think of this? Are you considering purchasing an iPod touch or an iPhone? Do you have one already and can see where this capability would be useful? Yes, I can confirm that the iPod touch does *not* have cell phone capabilities. This technique uses the iPod touch's WiFi connection to make a call over the Internet. This is similar to making a phone call from your PC using Skype. The primary difference between the iPhone and the iPod touch is that the iPhone has a cellular connection that can be used to make phone calls -or- browse the Internet over a cellular connection. The iPod touch *only* has WiFi- it does not have cellular connection. I've found the lack of a cellular connection on the iPod touch most annoying when in the car where it would be really handy to browse the web to look up addresses/phone numbers/store hours. But, from a cost perspective the iPod touch requires no cellular service plan and therefore once you spend your $229 on the device you're done- no contract. The iPhone is great but you end up paying ~$30 a month for a cellular data plan (on top of your cellular voice minutes) whether you use the phone or not. I agree that everything that Apple does is more proprietary than other companies, but right now based on my experience with the iPod touch, I'd put the iPhone way out ahead of the Blackberry Storm and the Google G1. The core interface is just so usefully awesome- I don't think the other devices compare. And the App store is growing in leaps and bounds so every day the device becomes better. Hey Kiran! Thanks for checking in. This stuff is really flaky isn't it? Let me know what your tests show- I think I'd use it only as a last resort in an international situation given my experience to date.